Want to tap your legs like professional dancers do? Enroll in a formal dance training academy. There is no age limit to learn dance though the younger, the better as it helps to develop cognitive skills. Dance class is not just about learning dance steps it is about body postures, muscle control, synchronization, rhythm, and techniques. Over a period of time, the body gains immense self control due to intense training. All this complements a child’s growth. Professional dance courses can give immense confidence to the child. Mastering a difficult step or technique can give them immense self-reliance that they can achieve any challenges with ease. Dance can help enhance self esteem in a child. Moreover, it can make a child bold enough to face the audience and showcase their skills. Stage fear can be eliminated through dance training. Instead of turning into couch potatoes children can turn fitter and stronger with dance classes. Bid goodbye to television, computer games, play station games and move on to a healthy and fitter recreation like dance to keep your kids healthy. A dance class can promote team spirit as the group works as a team for stage performances. Moreover, it gives them the opportunity to think independently and feel proud of their achievements. Children learn to respect their trainers and develop a healthy mindset. A dance class can help a child excel in various walks of life. The environment churns out happy individuals. A child grows in a happy and healthy atmosphere. Samba dance workouts can be really fun especially when your body is tuned to the music. Exercise can be untiring with samba dance workouts. The routine of doing repetitive exercises can become a pleasure with the music and some interesting leg shakes. The high energy beats motivate a person to workout. Choosing the right music that is associated with the steps can give you the energy to perform the workouts satisfactorily. Sometimes the music is associated with heavy beats that give more energy for workouts. Samba is high energy music comprising of drums and whistles and is African. It is played during carnival dance and is made up of non-stop beats and can make you sweat profusely. The energy that is associated with this dance form makes it enjoyable and an experience worth the effort. Samba dance workout flexes your muscles offering a well toned body. The workout along with the music releases endorphins that can exhilarate the mood. This ultimate happiness is what Theresa Stevens names Body Joy. This is more a concept exercise than a complete dance form. It can bring your body, soul and mind into a single line. Body Joy program helps to enjoy your body moves and at the same time makes you aware of the sensation the movements create. The best part of Body Joy program is that it can be practiced at home enjoying your mirror image. There is a sequence of steps to be followed and each step is based on physical exercise. Body Joy is more tuning your brain to perform sequential steps. Samba dance workout can give exercise to your brain in terms of learning and memorizing the steps to achieve perfection. This is not just a workout trick, and it has more to it. These steps can become a craze at weddings and parties. Just shake your legs with these impressive workouts and stand out in the crowd. Learning Samba dance workouts now has more to it than just physical exercise. It can take you to the highest level of excitement with its muscle flexing steps and exhilarating drum beats. Ballroom Dance is a couple dance form that is commonly staged in an upscale society events. The name is derived from the Latin word ‘ball’ meaning ‘to dance’. This form of dance dates back to the 12th century and was popularly referred by Shakespeare as cinq-pace meaning five steps dance. In the 17th century, this dance was known as Minuet after King Louis XIV embraced this dance form. The Minuet is popular across the globe. In fact, King Louis XIV founded an academy to popularize this dance form especially the five steps of the feet. Till the end of the Victorian era, this dance form was practiced integrated with ballet dancing. The Waltz is a contemporary ballroom dancing form that was prominently seen after the Victorian era. It was during this period that a number of ballroom dance forms were devised. Some of them include Mazurka, Polka, and Schottische. Post 19th century the Jazz and Jive were prominent on the dance front. During this time, the Waltz was modified slightly where the couples were given some free movement. Salsa is also another fast dance form that has made it to the charts and is practiced all over the globe. Some of the other ballroom dance forms include Tango, Viennese, Swing, Foxtrot, and Quickstep. 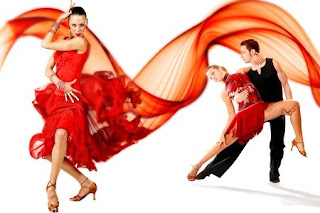 Latin dance forms like Samba, Jive, ChaChaCha, Passo Doble are also popular. In the 19th century, ballroom dance took over a new transformation with competitions give a new dimension to this art. The need for dance teachers became imperative, and The Imperial Society of Dance Teachers was formed. Despite a variety of ballroom dance forms available each has its own style, character, beauty, distinctiveness, and technique. This is not all the ballroom category also has night club dance styles like West Coast Swing, Merengue, Lindy Hop and Nightclub Two Step. Well known ballroom dance forms in Brazil include Forro, Pagoda, Lambada and more. 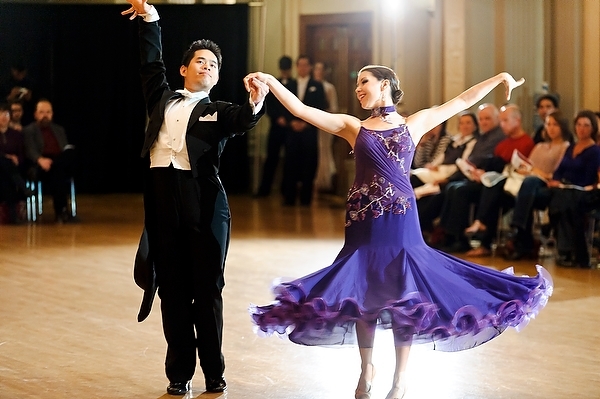 The ballroom dance costume is very professional that comes with a tailcoat and bowtie for men and full gowns for women. Recently tuxedos and vests have replaced the tail suit. The Latin apparel for women include short skirts and for men tight trousers and shirts that can display the body movements elegantly. Ballroom dancing can be termed as social dancing normally by couples. This is purely for amusement purpose and is normally seen during upscale parties and functions. Today Ballroom dancing denotes ten dances regularized by the World Dance Council and the dances listed by the American Style BDs. It is recommended to learn both dance styles to excel in competitions. The International Style originated in England and it is popular among international competitions. On the contrary, the America Style BDs is practiced in the US and Canada. This form is sub-categorized as American Smooth and American Rhythm. This is of typical America style. The Smooth follows International Standard, but the Rhythm follows International Latin standards. The two dance forms were popular during the mid 20th century. The three techniques followed by American Style BD include separate, open and closed dance movements. Though, the closed position is followed by International Standard. The International Latin follows a different pattern similar to the American Rhythm. These two are smooth dance form that happens on a rectangular floor mostly in a counterclockwise movement. Some of the other dance forms that are categorized as BD include Nightclub dances. In Europe, dance forms like Nostalgic, Disco Fox, Swing Boogie, Mambo, etc. are classified as BD. This is a classical dance form that was considered historic. Some of the traditional BD dance forms include Minuet, Polonaise, Mazurka, Pas de Gras, Quadrills and more. As time passed by certain dance forms were removed, and newer dances emerged. Ballroom dance is being taught to couples in classes that normally consist of around 20 people maximum. There is one to one coaching also available, but they come at a higher price. Private dance classes are expensive though they help you learn the dance form quicker due to the individual attention you get. The instruction teaches arm and body position to the students. Later footwork is explained. The most important aspect is to keep up with the timing or count. The dance is first learned individually, and then movements with the partner are practiced. Steps are taught one by one to help master the movements. Salsa dancing is a combination of body and foot movements. The origin of salsa is traced back to Los Angles and was founded by Vazquez brothers. The forward and backward movements of the dance give it a contemporary and energetic showcase. The movements are dramatic and include drops, dips, and tricks. Salsa has integrated many dance forms like jazz and hip-hop. The LA salsa in combination with hip hop and jazz is a treat to watch and resembles the New York Salsa. These two forms of salsa vary in style and rise and fall of the movements. New York Salsa is soft and smooth when compared to LA Salsa that uses explosive movements that can attract the attention of any passerby in a second. The movements are sharp and curt. It includes acrobatic movements that make it more powerful. New York Salsa is linear in execution similar to LA style salsa. This is a form of salsa is has laid back movements and can bring about elegance in the dance. Though it is relaxed, the footwork is complex and controlled. The technical drifts make this dance graceful and give an aerodynamic feel. The footwork in coordination with the cross body patterns makes this dance absolutely mesmerizing to watch. There is a look of spins that requires the dancers to be in great shape. The coordination of the partners is important to get the required feel and authentication for this dance form. New York Salsa can be classified into Contemporary Mambo and the Palladium Style. The former was popularized by Eddie Torres and is also called Mambo King. Here the movements are continuous and elegant. The feet change happens at the counts of 4 and 8. Palladium Style is similar to Mambo style, but the changing counts happen at 1 and 5. The dynamics of the dance changes with the change in counts though it may not appear to make a great difference for a spectator. Other forms include Cuban style that is more social. Here hip movements are the frequency in isolation with the full body. Here the footwork is simple but the arm work is complicated. Rueda de Casino is well known in Havana. In this form of salsa, the caller communicates to the couple on the change in movements. There is no limit on the number of dancers in this form. Why Formal Dance Training Is Necessary? To excel in any formal training is needed, and there is no exception when it comes to dance. Despite in-laden skills and passion for the art form without proper training, you can reach nowhere. There are many dance forms and choosing the ideal one that suits your child’s attributes and personality can make a big difference. Analyze the mindset of your child before deciding on a dance style. The interest of the child matters a great deal before signing off for a dance class. Formal dance training is a long term commitment and ensures that your kid has time and passion to pursue the art. For some dance is just a means to remain fit and for others it is a way of expression. Starting early can help get good muscle coordination and control. Dance is all about postures and expression that is not available in any other form of art or sport. The confidence and strength that dance brings is hard to find in other recreational activities. Dance can teach you how to maintain a strong and healthy posture and avoid movements that are bad for your body. Ballet dance is the foundation that can get you easily adapted to any other dance form. Discipline and concentration come with dance helping students top in their studies. The concept of patterns can be learned through dance and the skill to visualize errors is far more superior in a dancer than a non-dancer. A formal training can enhance mental alertness, memory and understanding sequence better.